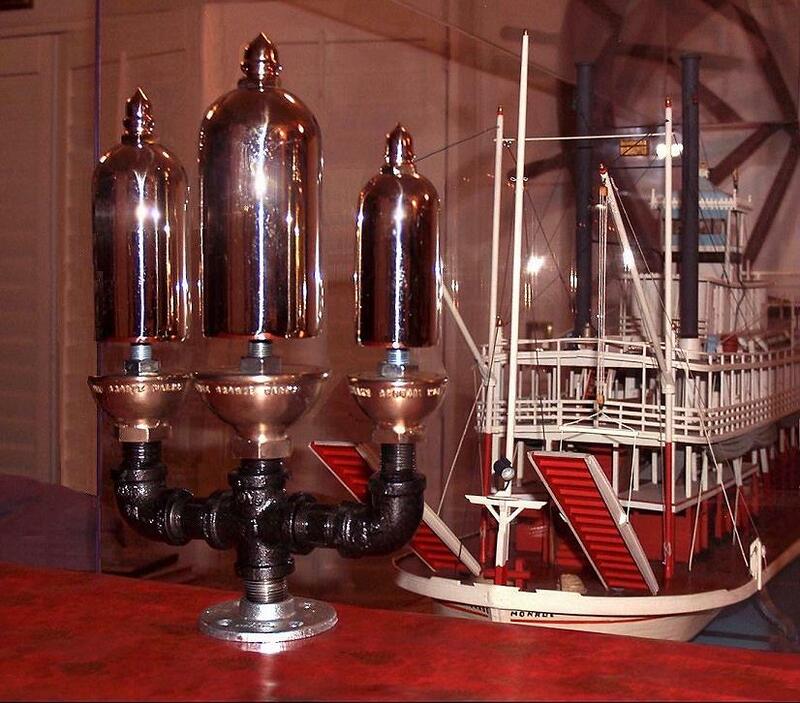 The pilot wheel from this boat is in the steamboat room. 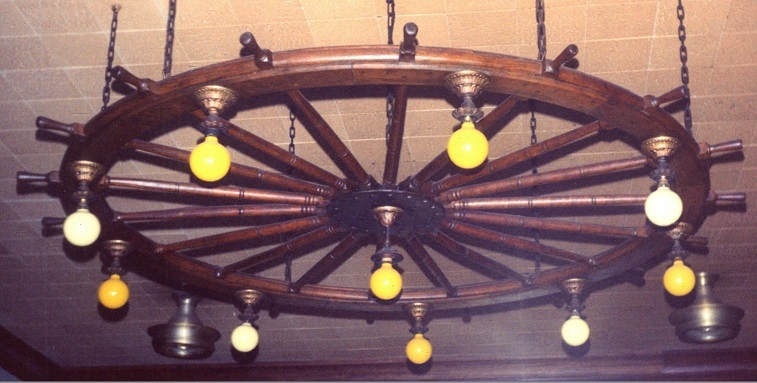 Jim Hale took this photo when the Peerless pilot wheel was hanging as a chandelier at Weidmann's Restaurant in Meridian, Mississippi. 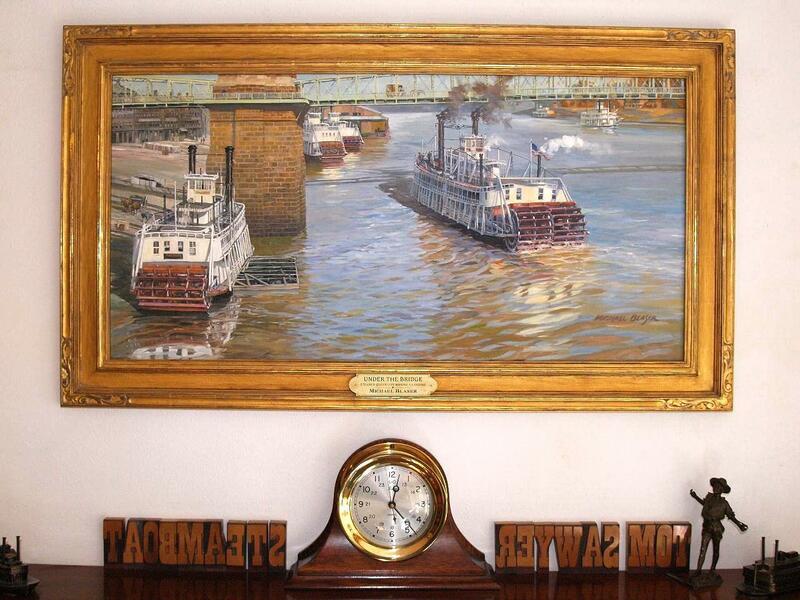 Weidmann's also owned the large mural, then later Dave acquired it from a Meridian antique dealer. 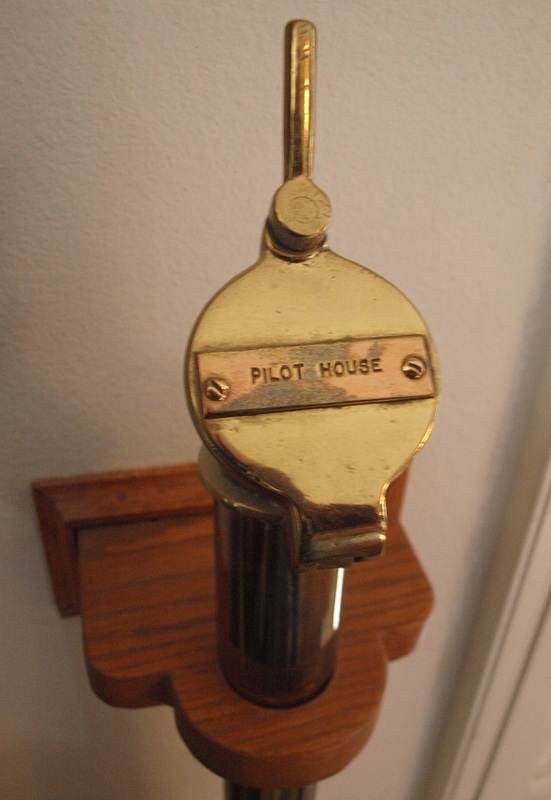 The Peerless pilot wheel now hangs in Dave Thomson's townhouse in Los Angeles County. 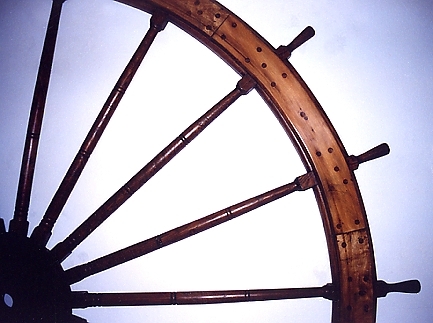 Here is a close up of the wheel since restoration with old holes drilled for light fixtures gone and lustrous sheen to old wood brought back to life. 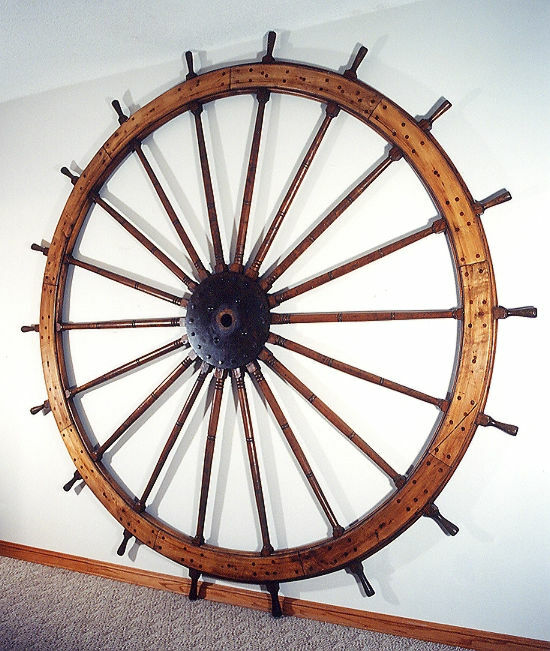 The pilot wheel is from the little sternwheeler Blue Wing which operated out of Keokuk, Iowa early in the 20th century. 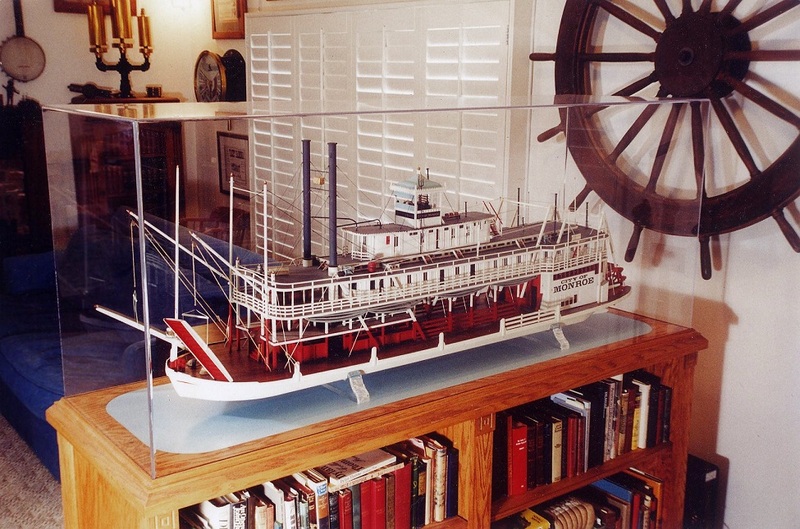 The sternwheeler City of Monroe is a 5 foot generic model based on Captain Cooley's boat the America. It was built by James Hale of Sylvan Springs, Alabama in 1975. 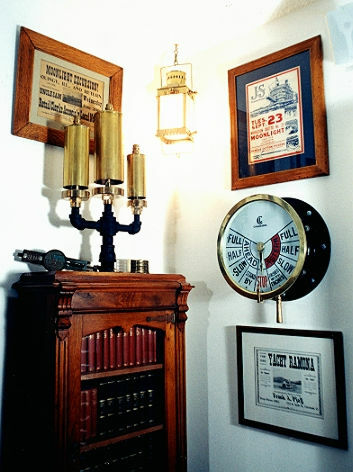 The whistle, steam gauge and engine room telegraph are original. Not visible is a pilot house telegraph and speaking tubes for pilot house and engine room. Half of the library consists of books on the history of the Western Rivers including steamboats, river cities and river towns as well as fiction inspired by river history. 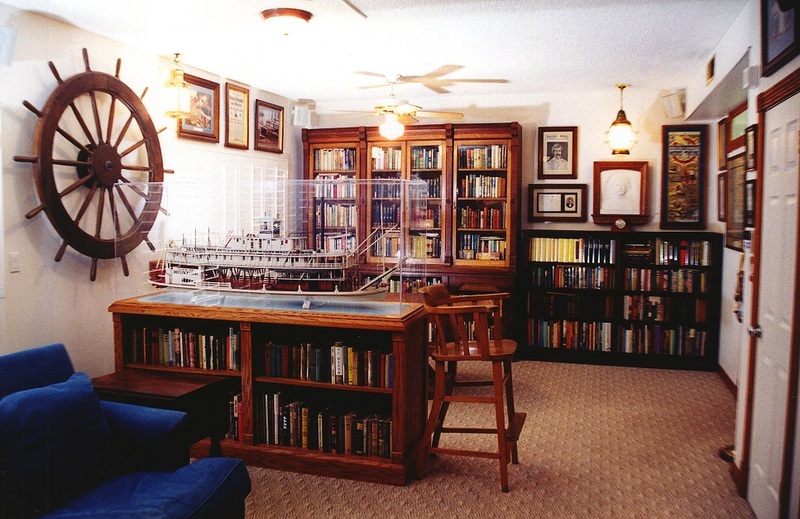 The other half of the book collection is made up of all of Mark Twain's books including many illustrated foreign language editions of Tom Sawyer and Huck Finn and local history books about Hannibal, Missouri. 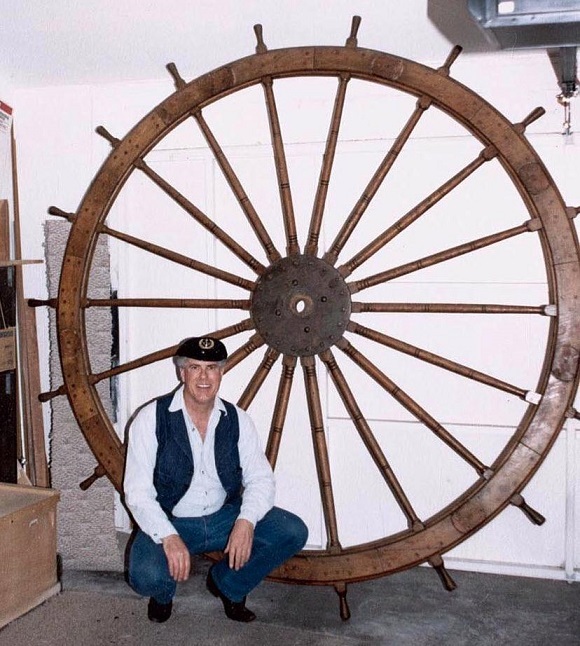 Dave Thomson owns a wheel that came from the pilot house of the Peerless. 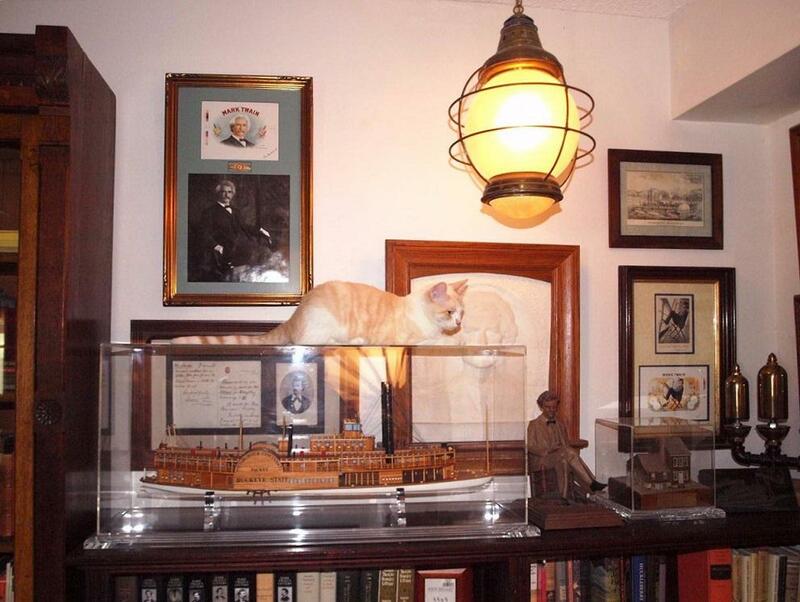 Originally built by Captain Norman Staples in 1900, they christened the ship the "James T. Staples." On January 11th,1912 at Powe's Landing, Alabama the boiler exploded killing 26 persons and injuring 21 others. 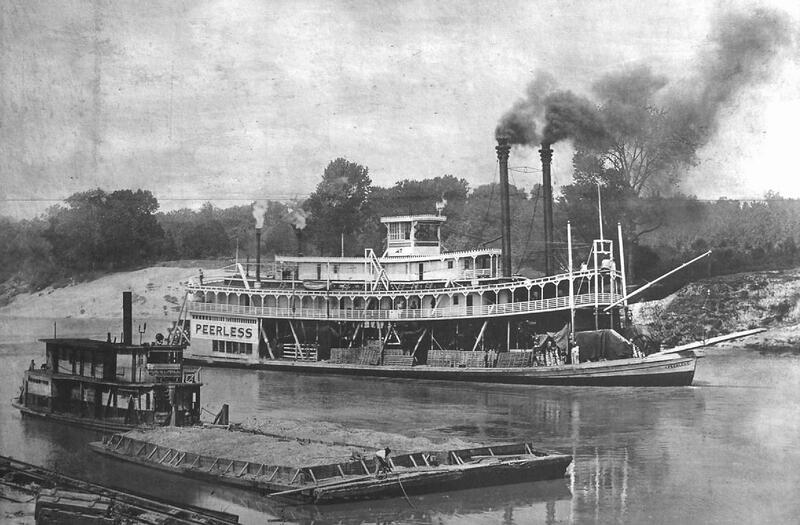 The wreck floated down and sank below Bladon, Alabama. Mr. James Little, president of the Peoples Bank, bought the wrecked boat. 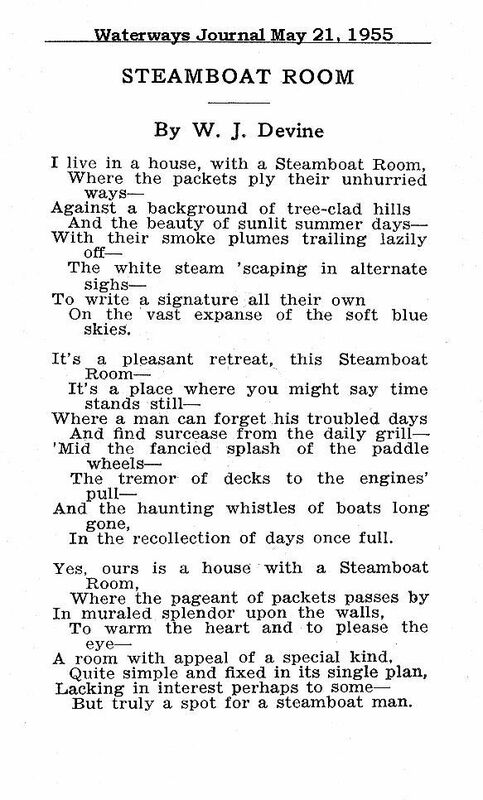 He raised it, rebuilt it, and put it back into business as the Peerless in 1915. 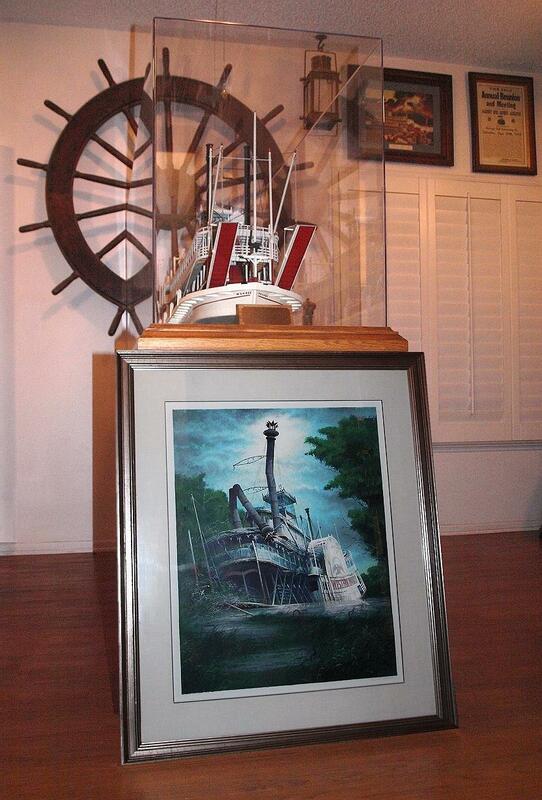 In 1924 Little sold the Peerless to Captain O. F. Burke, who renamed it the Helen Burke for his sister. The boat was abandoned in 12 Mile Marsh above Mobile and "rotted down" as Fred Way says, during the years 1929 - 1930. 3 chime whistle made by Chesapeake Bronze Works in Rock Hall, Maryland. 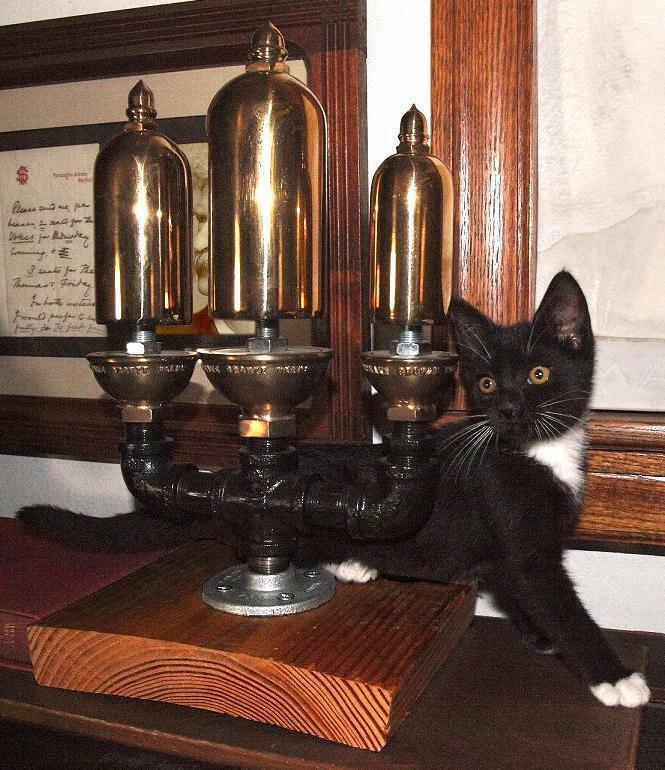 First photo is Abby as a kitten posing with the 3 chimer and some framed Mark Twain stuff. Second photo is the 3 chimer with Jim Hale's CITY OF MONROE model. Here is a framed original silk screen of a Robert Addison seragraph (1924-1988) of a haunted derelict steamboat he named the WESTERN WORLD. 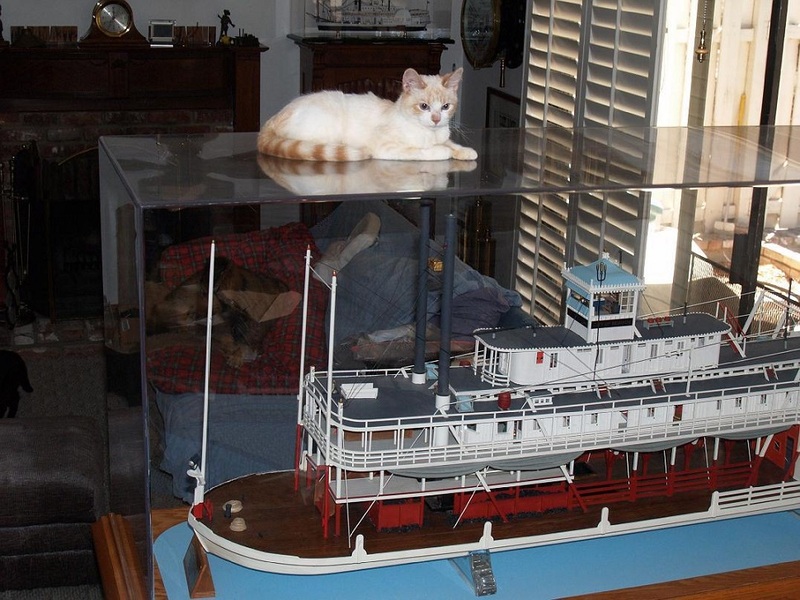 Photo taken downstairs in the "River Room" with the WESTERN WORLD leaning up against the display case that holds Jim Hale's model of the cotton packet CITY OF MONROE and behind that on the wall is the 5 foot pilot wheel from the towboat BLUE WING that was built at Keokuk, Iowa in 1929. "1973 seragraph print, by illustrator and painter ROBERT ADDISON, from Merrill Chase Galleries, with all accompanying paperwork. A signed, unnumbered trial proof, from the artists' collection, with image area of 20 x 26" in a custom frame measuring 29 1/2 x 35 inches." 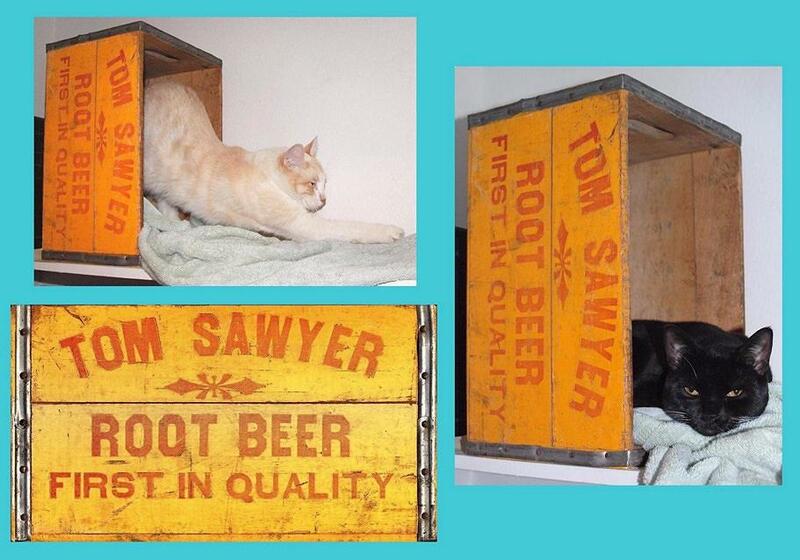 Both Goldie and Abby liked the vintage TOM SAWYER root beer crate as a sleeping hideaway when it was on the top shelf in the office closet. Goldie and the Rob't E. Lee. 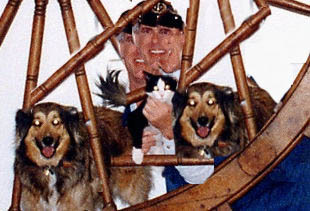 Yours truly with Toby the devoted Shepherd/Husky mix, Bart (short for BartholoMEW) the well behaved deaf white cat, Ginger the sweet Golden lab mix and Punky the ex-wife's devoted dog. The illustrations in the Foreign editions of Tom and Huck are often worthy of art galleries, real Fine Art. 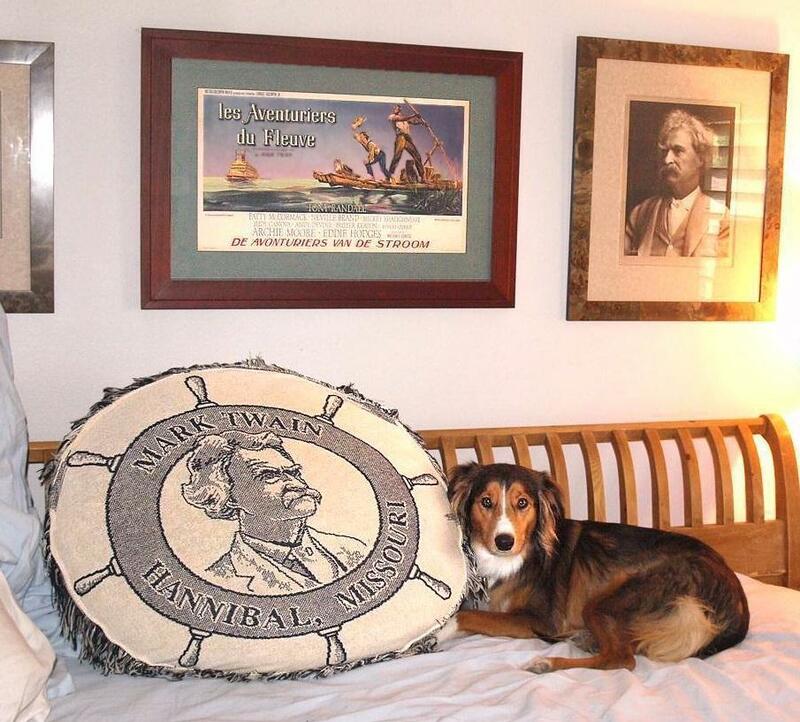 Attached photo taken about 6 years ago of Cookie on the sleigh bed with big pillow made from a sham of Hannibal and Clemens that a talented lady at feature animation made for me back in the 1990's. The framed poster was from Belgium for the 1960 MGM version of Huckleberry Finn. The title was translated into both French and Belgian. The framed photo of Mark Twain was an original taken in 1906 one of the prints that was sold to raise funds for disaster relief to assist survivors of the San Francisco earthquake. 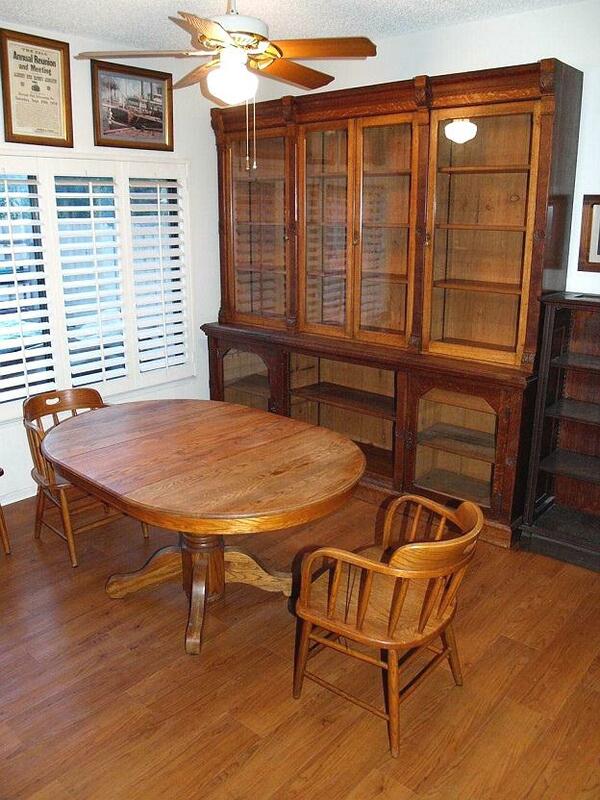 Clemens had worked in 'Frisco during the 1860's and had many friends there. I have one other photo taken by the same photographer (Bradley) in '06 in a matching frame taken from a different angle that was one in a series of pictures sold for the same disaster relief effort. 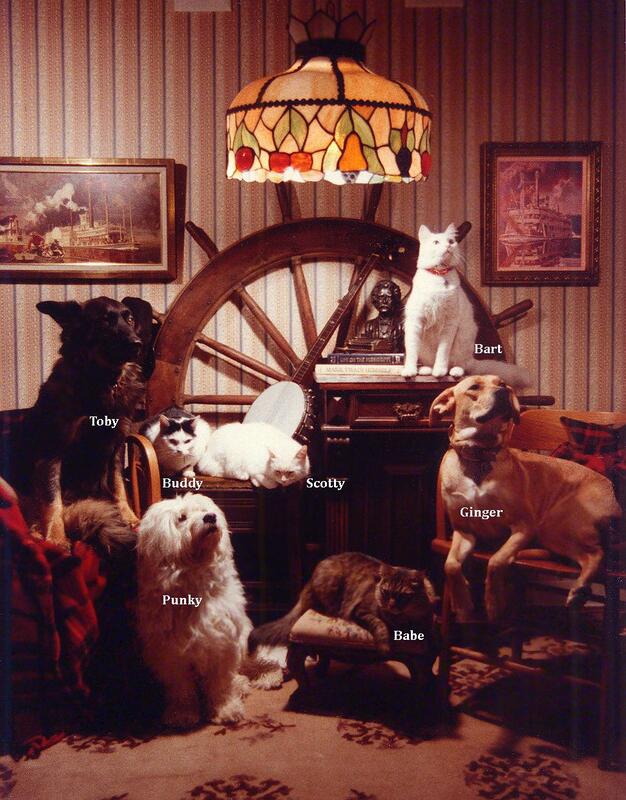 While I was married I'd pose our gang of critters for the Christmas card ever year. The population grew during that 10 years. This was the last one taken at our Sepulveda home. Also attached photo with the names attached for identification. It was nerve wracking trying to keep these characters from running away in the process, especially Babe, the cat at the bottom. The pilot wheel is off the 1929 sternwheel towboat Blue Wing up at Keokuk. 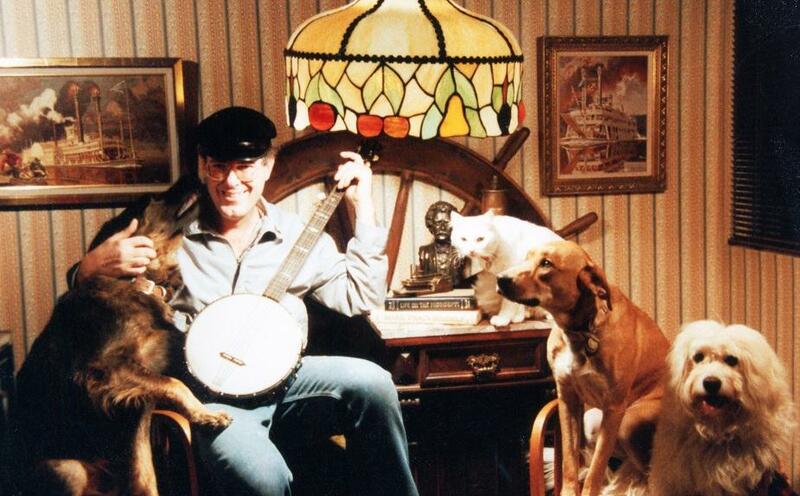 The 1905 banjo is the one I use for decor since I never mastered the instrument. The steamboat prints are by illustrator Dean Cornwell. 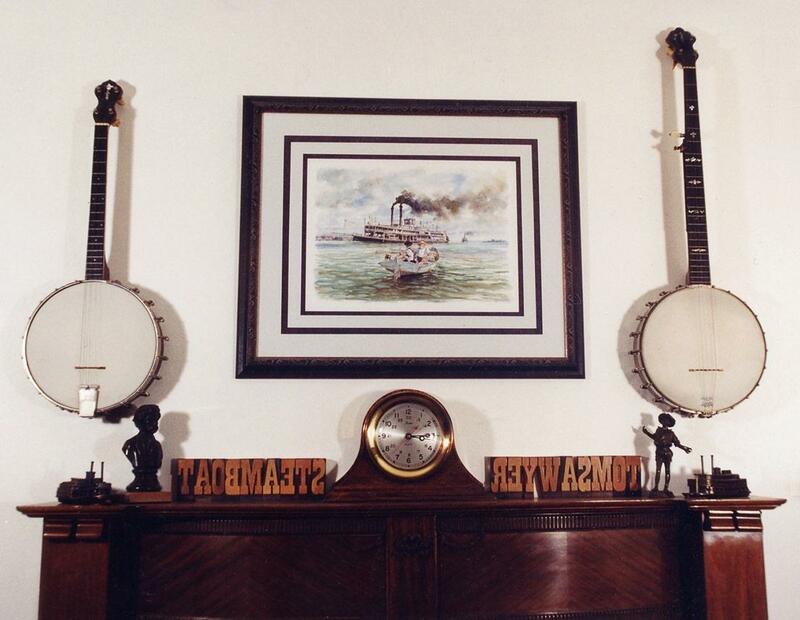 Photo of the mantle downstairs here at home years ago when Tommy Thompson's original framed and matted watercolor of the VIRGINIA called "Majestic Passage" was at center with two early 1900 vintage banjoes were displayed on either side. The silhouetted bust on the left is of Mark Twain. It's so dark that his features were not recognizable although the camera's flash illuminated everything else pretty well. Still have the banjoes but haven't had them on display in a long time. This is Michael Blaser's UNDER THE BRIDGE painting which I received from Iowa today and put it back in the frame that was made for it. Michael adjusted the hog chain posts on the Queen City and Tacoma to correspond with a reference model that Fryant built of the QC and photos of the Tacoma. This is above the hearth of my fireplace with ship's clock and some old wood type spelling STEAMBOAT and TOM SAWYER. Little like vintage bronze sculpture bronze on the right is the spitting image of Tom Sawyer. 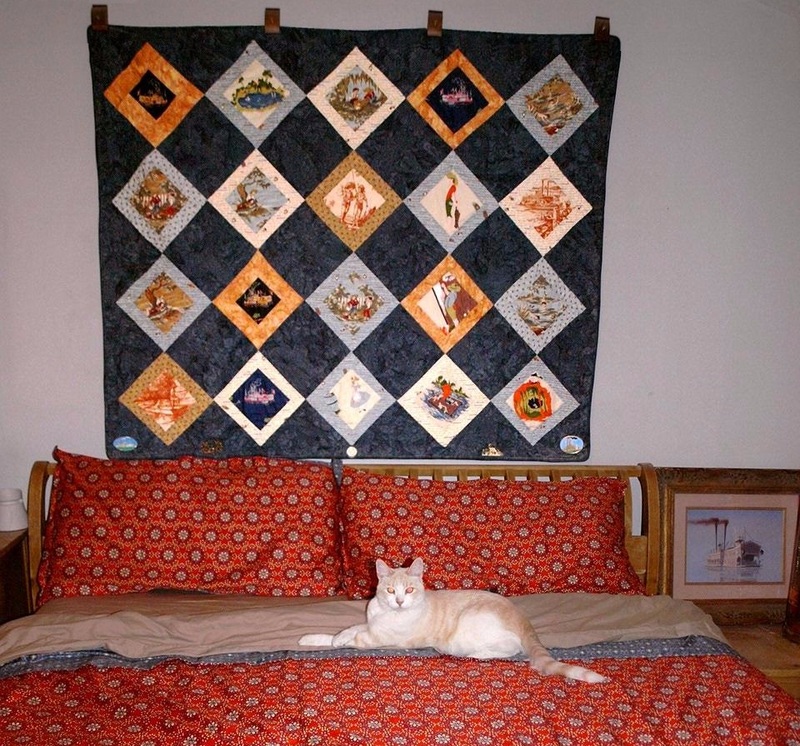 Attached photos of a quilt I commissioned seamstress Joyce Riggs of Quincy, Illinois to make for me about 10 years ago. The Tom Sawyer/Huck Finn and steamboat fabrics I bought over a span of years on eBay then bought additional blue and gold fabrics in Quincy which designed to appear to be water-stained. The detail of the steamboat in a sepia pen and ink drawing over beige was a nice graphic. 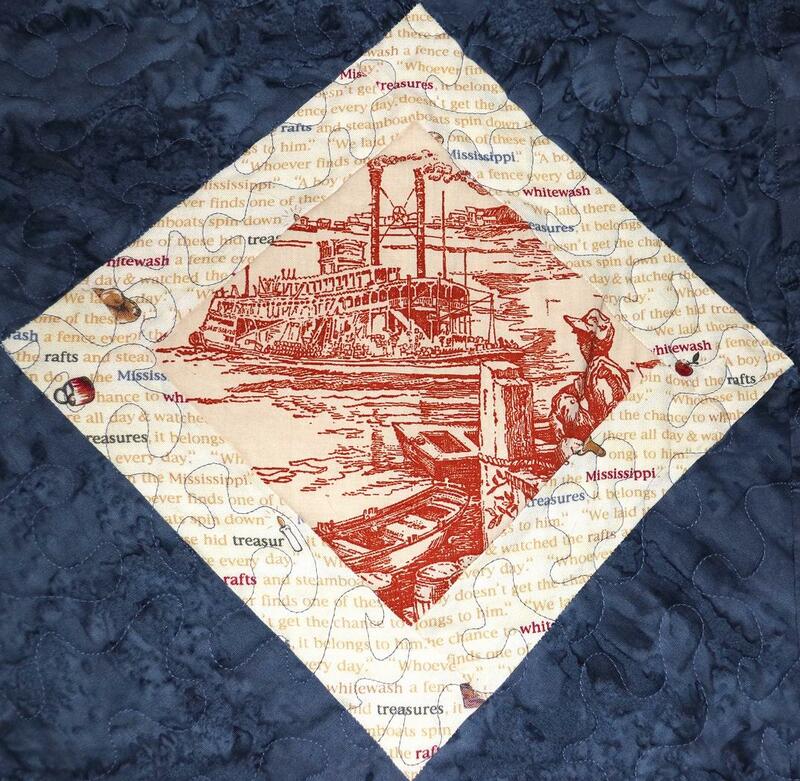 An accent fabric was printed with sentences from the text of Tom Sawyer which included words like rafts, whitewash, treasures and the Mississippi. 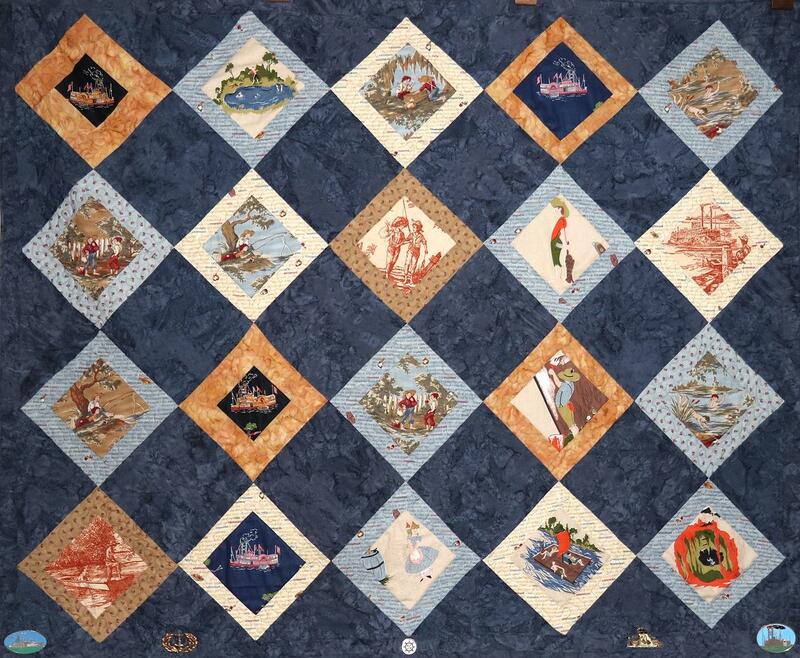 The quilt measures 50 x 60 1/2 inches. Displayed over sleigh bed with Duvet cover and Goldie cat. 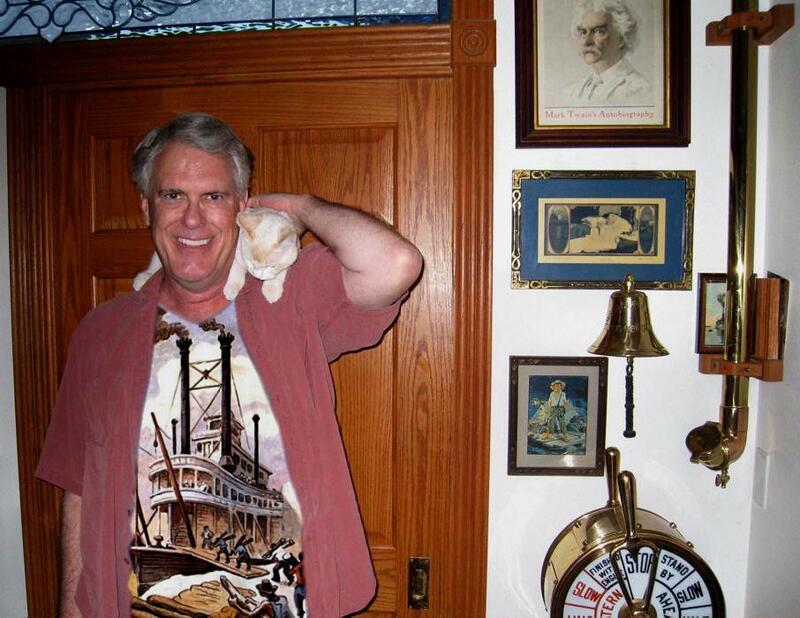 Goldie cat and yours truly under stained glass in transom over pocket door to kitchen, Sam Clemens items: 1907 framed cover of a Philadelphia Press Sunday supplement, a composite of Sam at 70 working in bed and Huck Finn by Iverd, MISSISSIPPI QUEEN brass bell, pilot house telegraph and engine room speaking tube in northwest corner of River Room. Tom Benton's frontispiece for Sam's LIFE on the MISSISSIPPI revealed by the open shirt has been processed in as a bonus. 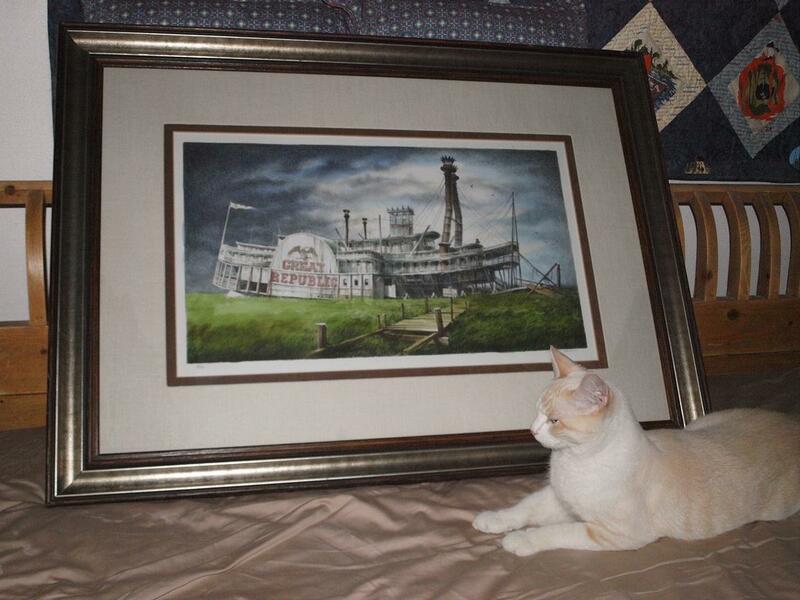 Abandoned steamboat GREAT REPUBLIC serigraph signed by the artist Robert Addison with color that he added by hand. Image area 13 1/4 x 23 1/2 inches. 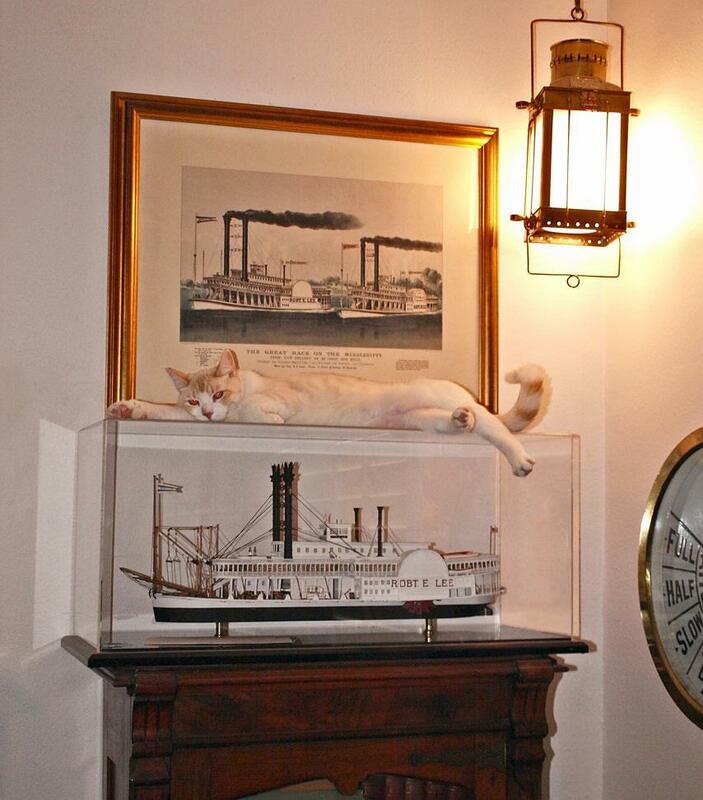 Goldie kindly posed with the heavily framed art. Another corner of the River Room with Clemens-Mania stuff etc. Hinged lid on PILOT HOUSE speaking tube on the south wall next to Jim Hale's model of the CITY OF MONROE. 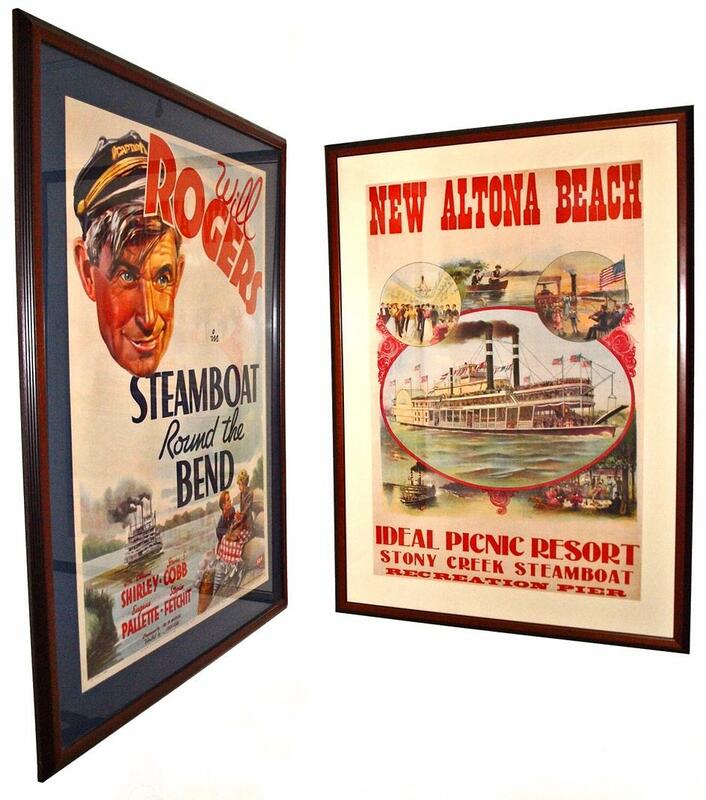 Here are the two big framed posters 1935 STEAMBOAT ROUND THE BEND and the 1895 CINCINNATI color lithograph.They're in the corner on the stair landing between the first and second floors where I can enjoy them during each hike up and down the stairs. 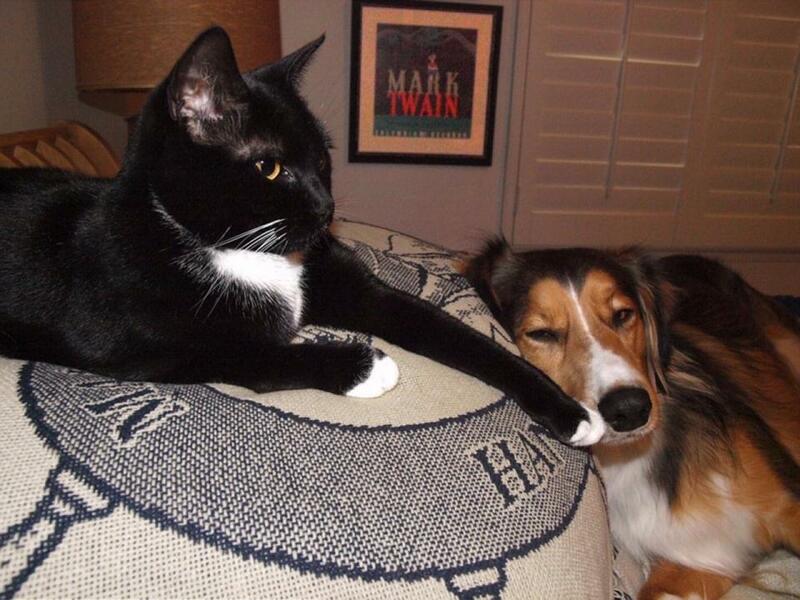 The way they're situated together reminds me of the memorable hymn BRIGHTEN THE CORNER WHERE YOU ARE. 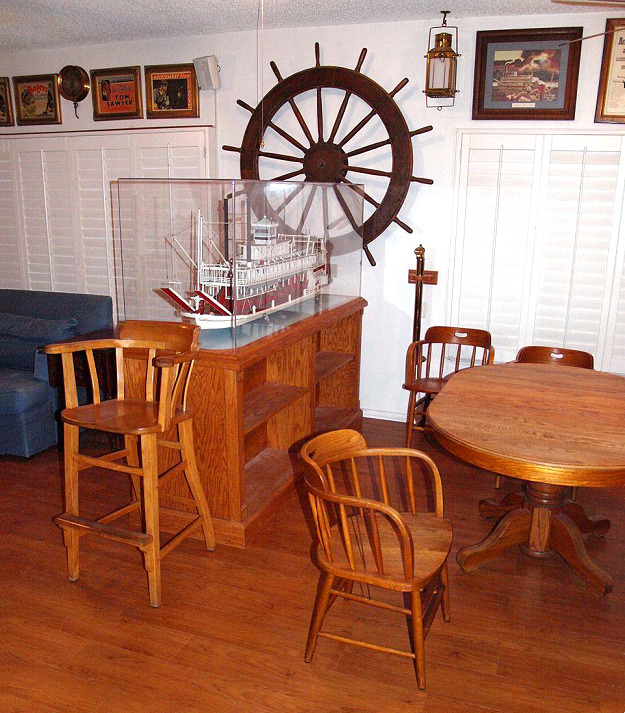 "Someone far from harbor you may guide across the bar" has a nautical connotation and"Here for all your talent you may surely find a need" is appropriate to the life and career of Will Rogers. Ira D. Ogdon (1872-1964) was a public school teacher who had plans for an evangelistic career. She abandoned that dream to care for her ailing father. Ogdon wrote "Brighten the Corner Where You Are" in 1912 and it was published in 1913 with music by Charles H. Gabriel. First heard in motion pictures played by a Salvation Army Band in Jimmy Cagney's 1931 classic Warner Bros. gangster film PUBLIC ENEMY.